Your number one stop for all your party needs. With so many party rentals companies out there to choose from, we know this process of planning an event can be overwhelming. 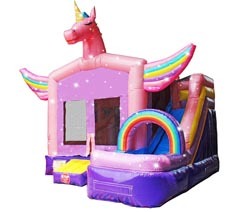 That’s where we come in, here at Party Rentals R us, we make the process as simple and smooth as we can, with straight upfront pricing, online reservations, on-time delivery, cleaned and disinfected bounce house, you have nothing to worry about. 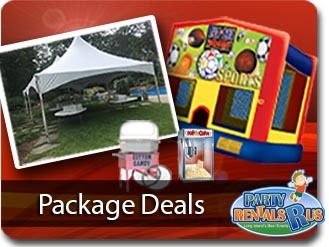 Party Rentals R us is a premier party rental provider in Long Island, servicing all Nassau and Suffolk counties. 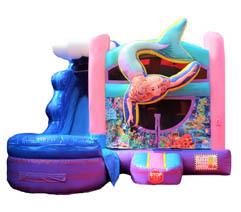 We carry a large selection of state of the art inflatables such as Bounce Houses, Combos, Water Slides, Dry Slides, Interactive games, Carnival Games, Dunk Tanks, tents, Tables, Chairs, and concession machines like Pop-corn, Cotton Candy, Snow Cone, Pretzel Warmer, New York City Style Hot Dog Cart, and much more. We have been in business since 2009, with 9 years in the business we have accomplished great online reviews and outstanding local reputation, we have done from small backyard birthday parties to some of Long Island’s biggest corporations events including schools and churches. Give us a call today, and see for yourself the level of service you will get from Party Rentals R us. We’ll guarantee you will work with us for years to come. Discounts valid Mon - Thurs Only. Excludes holidays and weekends. Planning all the details for a large company event can be a big job. 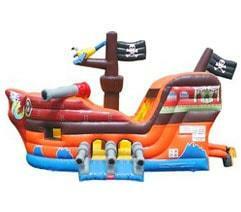 Party Rentals R Us can make that as simple as one phone call. Use the link below to get details on great corpoorate event packages. Our local schools and churches are important to our whole community, that's why Party Rentals R Us has created special high value carnival packages so you get all the fun at a price that meets your budget. 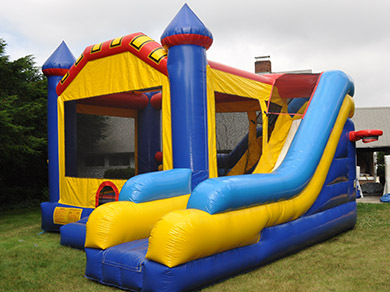 Bounce Houses are America's favorite event attraction; from small backyard parties to the largest corporate events. 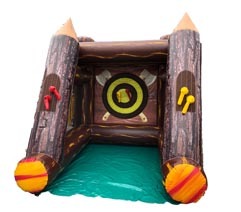 Party Rentals R Us has a great selection of high quality bouncers ready to work for our Long Island customers. 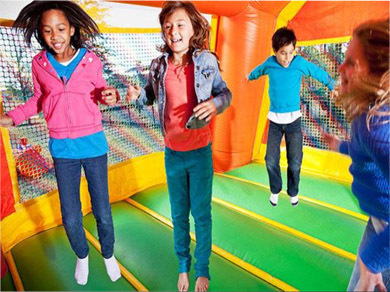 Combo Bouncers get their name from being a "combination" of the popular bounce house and additional features like climb & slide, basketball hoops and popup obstacles. 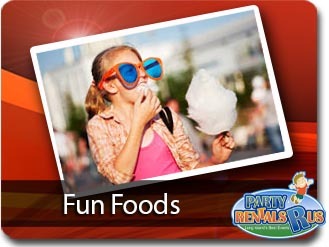 You get extra value in your party rental and kids have more fun! 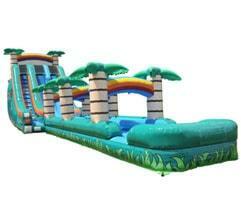 Get ready this season for some wet & wild fun with a water slide rental from Party Rentals R Us! 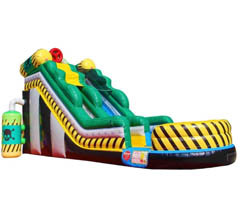 These awesome slide can be used wet or dry, but when you add a little water the fun really gets going. Large selection in size & color. Interactive game rentals are a great way to add a ton of excitement to your event. 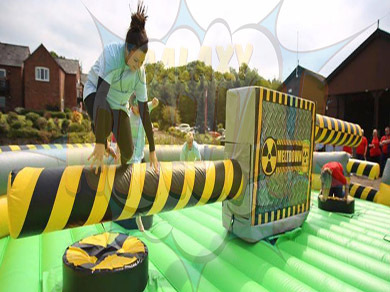 These fun, inflatable activities allow your guests to come together in the spirit of fun and friendly competition. They are great for all ages! 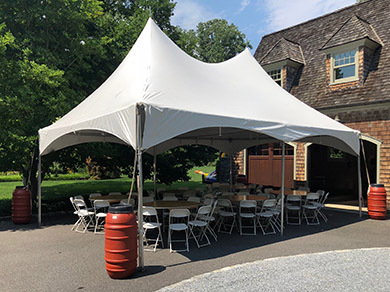 Long Island parties are always special events and Party Rentals R Us has a great selection of tent canopies, table & chairsets, and lighting to make your outdoor celebration truly memorable. Check out all we have to offer here! 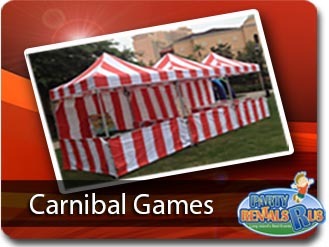 Add fun and excitement for all ages when you plan for carnival games at your next event. These simple skill games will have all your guests engaged and having fun. Rent one or rent them all and create your own carnival midway! What's a party without a Popcorn, Snow Cone or a Cotton Candy Machine? Our commercial grade concession Machines will add sweets to your party event while giving kids the added energy boost they need to have fun on our Bounce House Units! Let's face it, everybody wants a good deal and party rentals are no exception. 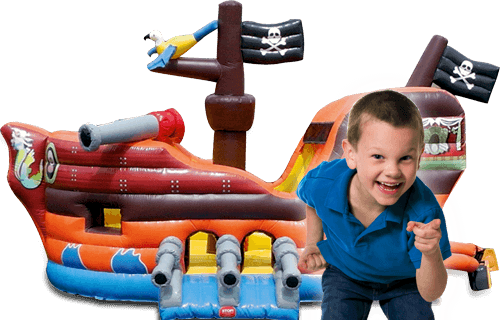 Party Rentals are Us has the experience and the resourses to provide you with the best party package deals on Long Island. See our complete selection of super deals. Dunk your friend or just about anybody you like. 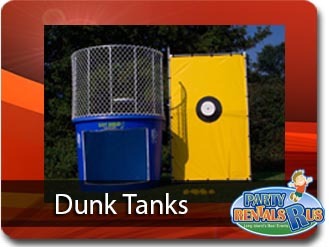 Our dunk tanks are always a hit in hot summer days. Everybody gets pumped up to go in. Dunk tanks come with 3 balls and a target. You have to throw the ball at it to dunk the person into the water.